Family Thesiswhisperer recently signed up to Netflix. Or as we call it in our house – ‘Netcrack’. Work is, as usual, insanely busy, and the Canberra winters can be bitterly cold, so I find myself on the couch with the remote in my hand most weeknights. The problem great thing about endless, on demand film and TV is you find yourself watching things you would never, ever choose to watch on TV, borrow from a video store (remember those?) or buy as a DVD. This is why, one evening last week, while my boys amused themselves with video games, I found myself watching a couple of Jeremy Jones documentaries. For those of you not familiar with his work, Jones is a ‘free-rider’ who climbs mountains and snowboards down them for a living. Can you see Jones trudging up this slope? That’s one serious whack of mountain. Jones spends hours and hours, flying around the world, climbing these kinds of mountains and speeding back down them on his snowboard (and producing perfectly crafted product placement shots). It makes for thrilling TV. The images are beautiful, and startlingly clear – thanks to those new digital cameras, which he straps on his body. It’s like watching footage of a rollercoaster, but you know – with snow and rocks and stuff. Since I can manage to fall over on flat snow while standing still on my skis, from my perspective it’s much better than actually being there. “The snow that is set into movement when snowboarding or skiing in steep terrain (above 40 degrees)… If the slope is sufficiently steep for a couple hundred meters, the sluff can get very fast. 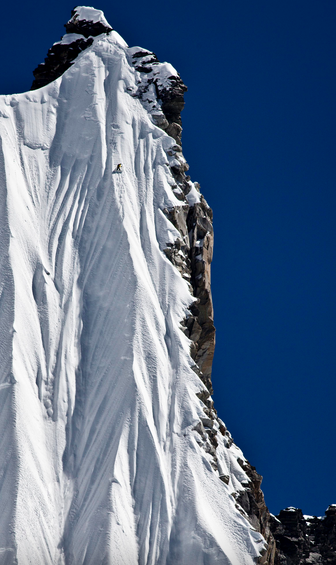 One turn on top of a steep face can cause a sluff that reaches avalanche-like proportions. 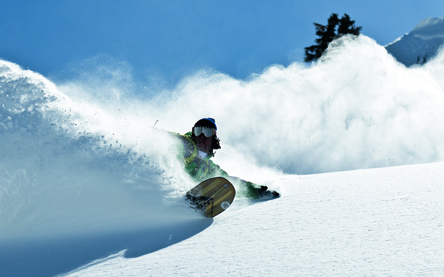 A relatively small sluff can knock a snowboarder/skier off his feet and take him for a fast and dangerous ride down to the end of the slope or over a cliff. See that cloud behind him? If Jones isn’t agile, and doesn’t move quickly enough, he will be engulfed in the sluff he has created and fall off the board – or worse. Some of the shots of this actually happening when he is moving at 70 miles an hour are heart stopping. A lot of the narration on Jeremy Jones films is about ‘sluff management’. Sluff. What a fun word. Take a moment to say it aloud: “sluff”. I love finding new words, especially ones that perfectly describe a phenomena you experience all the time but don’t have a name for. You see, I’m always getting caught in my own research sluff. I tend to work fast – generating findings, making connections, thinking of ideas. Along the way I make many small pieces of writing. If you don’t take steps to manage the little bits and pieces of text as you go, that writing sluff is going to bury you. One of the most obvious forms of writing sluff is references. I’ll admit I tend to pop references in a bracket with a note to myself rather than use the cite-while-you-write function. Sometimes I pause long enough to run a highlighter over it, but often I don’t. Later I have to spend hours, wading through my referencing sluff to find the right paper and get all the commas in order. In a thesis sized project that sluff will kill you (use a referencing system). Note-taking sluff is perhaps the most dangerous. By the time you get to a thesis you will have what my colleague Shaun Lehmann calls ‘fossilised habits’. If you continue to unreflectively scribble stuff in margins, or on scraps of paper, that note-taking sluff is going to engulf you before too long. Online databases are one answer. I’m a huge Evernote fan, but I don’t think it’s the whole solution. The trick to not being engulfed in your own note taking sluff is to recognise the types of notes you are making. Have you noticed that some great ideas happen when you are doing something else? I thought up the Thesis Whisperer blog while I was in the shower. Old fashioned technology of pen and paper is the quickest way to get random thoughts on paper (after you have dried yourself off of course!). The interesting thing about the ‘frozen thought’ kind of note taking is that I rarely, if ever, read them later. The act of note taking is more important than the note itself. Taking the note slows the thought down for long enough for me to see if it’s any good. The notes you take for your literature sections are different. The form of the note and where you keep it is very important. I now write literature notes directly into my paper or chapter instead of into a database or separate document where it can easily get lost. By writing notes straight into your paper or chapter, you avoid making unfocussed observations about what you are reading. You are forced to read more carefully and relate the note you are making to your own work, rather than just generate unfocussed observations. A pile of unfocussed observations is just sluff you will have to deal with later. There’s a more detailed outline of how this writing method works here and I’ve put a verb cheat sheet that I use to help me do this online in my downloadable worksheet section. But now I’m wondering what you think? Do you generate research sluff? Does it ever engulf you? What do you do to manage the sluff? Love to hear about it in the comments. If you are an ANU student who wants to learn how to better manage the sluff, I’ll be running a workshop called ‘speedy notetaking’ that covers some of the research on effective note taking and a wide range of techniques that you can use. Have a look at our event page for details. This entry was posted in Getting things done and tagged notetaking. Bookmark the permalink. I did not know that! I’ve been saying it wrong my whole life in that case! Thanks for the post. I also had to try saying the word out loud… it is fun. The one thing Evernote (or a similar online note-taking tool) has going for it, though, is the instant online backup. As you might be able to tell, I speak from tragic personal experiences when I say that online backup is a treasure. To conclude, in my world, there is room for the hand-written and the typed alike. My behaviour now has a name, thanks to you – I am sluff-queen. I have forever banked on my previously reliable cognitive synaptic connectivity to retrieve references and snippets of information, but doing a PhD in 2015 is on another data stratosphere. It relies on BiG DATA , and it requires a database to do it justice, or maybe that is how we researchers perceive it … I am upgrading endnote, and changing my writing habits so that endnote is permanently running in the background, and upgrading my technology which I’d rather not do and which is a MASSIVE nuisance. But then I wonder: perhaps some “sluff” doesn’t actually need to see the light of day? Maybe some “sluff” is propaedeutic, and for my eyes only? Now the first thing to say is I am tempted to turn on Netflix and watch some of this guy creating his own ‘sluff’ whilst I wait for my Mac to do some updates. I realise reading your post that I am currently in the midst of creating a ‘sluff’ database of literature for a paper I am writing. I’m doing this in an attempt to ‘organise’ my thoughts and summaries about all of the papers I am reading. Is there a better way? On the other hand I do have a ‘spare’ chapter that I have created to ‘hold’ all of those thoughts that I think might be useful but I don’t have a place for yet in my thesis, so far so good on this front. Maybe my spare chapter is the ‘junk room’ no one sees when they come to your house?! I would be interested though to know of any other tools people use to assist them with their ‘sluff’, anyone used Scrivener? As for tomorrow? On with the ‘sluff’ but with more awareness and hopefully more agility to try and keep ahead of it! I’m an avid scrivener user and it really helps me keep track of a lot of the sluff… but it’s a never ending process! It’s funny that I should come across this today, on the day when I am about to jump into my MacBook files and do some serious sluff streamlining. Or maybe it is de-sluffing. Whatever it is, I have a (much nicer) word for it now, so thanks for that! I get frustrated with myself that I do so much sluffing and then seem never to reread or revise it. In fact, being annoyed with the amount of sluff I have has led me to sluff less often. The problem is that I haven’t replaced my sluff habits with anything else. I’ve gotten myself stuck in the “Oh, well there’s no point writing notes I’ll never look at again.” mindset, which isn’t great and I suspect isn’t even accurate. I wonder if it might be wise for me to schedule a Shut Up and Streamline Sluff hour every few days or every week. That way, I can gather all my weekly sluffings and view them as one to see what sort of progress I’ve made over the week… what sort of direction the work is taking.. what sluff I want to keep… how that sluff relates to other sluff.. etc etc. ‘Sluff’ is a great-sounding word and a nice powdery metaphor. I also totally agree that magical brain stuff happens in the in-between moments. My best progress is made when I follow intensive periods of work with intensive periods of space – walking, showering, being in nature – which somehow allows what I’ve recently worked on to percolate and surface new ideas. I said it aloud and it was great! I’ve been thinking about thinking too this week. I’m on holiday but all my brain wants to do is come up with ideas for articles, snippets of paragraphs, and preparation for a (PhD related) interview. My best ideas tend to come on the journey to and from work. I actually really enjoy this creative time and seeing what pops up from the depths of my mind. But I do worry that too much thinking and not enough “switch off” is dangerous and will lead to burn out in the end. Hard to turn your brain off though isn’t it? As a chemist, I have serious organizational sluff. I have an organizational scheme for new compounds I’ve made, a scheme for existing compounds I’ve remade, a scheme for papers I’m reading, a scheme for reactions I’ve run… sometimes there’s so much organization (though I’m sure it’s necessary) that it feels like I spend more time getting organized than I gain from organization! As someone who loves well thought-out scifi and is trying to get his own work out there, sluff is almost all there is. I’m constantly refining my universe for consistency and story effect. When I decided to write a book (series to begin with) it was too daunting a task to see accomplished. I found WordPress this week and now I’m releasing what I already have and am capable of generating based on what already exists about my universe episodically. This way I’m motivated to generate content fast, make sure it is consistent, as some things are already published, and it motivates me to write more open-ended content, like a TV show, which I think lends itself to perhaps the most in-depth story telling. In another life I was a technical writer and we used a wonderful program called FrameMaker to create our long and complex documents. Framemaker is a dream…it is WYSIWYG but it also uses tags to format just like latex does. Best of both worlds. When I start doing my thesis, I would love to be able to use it, but alas none of the reference managers I love (esp. Mendeley) are compatible.